Sara began with agility in 1995 when, persuaded by her best friend, Neda, she enrolled in an agility course at KOSSP "Zagreb" with her Bearded Collie, Toto. Sara gradually came to realise that this sport suited her and Toto well and that through agility she could realise her great desire to spend more quality time with her dog. By working with Toto, Sara experienced the beauty of working with dogs, the excitement of competitions and the illimitable ways in which our dogs can boost our spirits and cooperate with us. As a result of her involvement with agility she has travelled around almost all of Europe with her dogs and has competed in Slovenia, Austria, Italy, Hungary, Slovakia, Belgium, Denmark, Switzerland, Germany, Luxembourg and elsewhere. Sara and Toto were Croatian agility team members and represented Croatia at four World Championships. In 2000 they became National Champions. 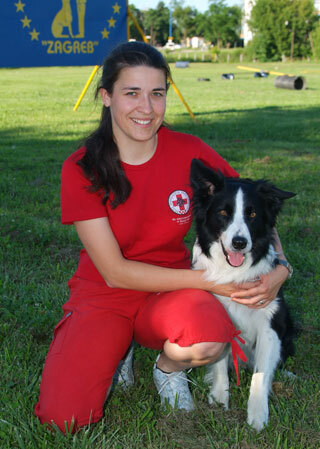 Sara competed with Cap in agility at the World Championships 2004 in Italy, and 2005 in Spain. Sara has held obedience classes since 1997 and she is a licensed instructor for basic obedience and agility. She has also been the club's SAR licensed instructor since 2007. She has also been training search and rescue since 2000 with her two dogs, Toto and Cap (Mawlch Cap), and she is a licensed rescue dog handler. In 2005 she became world champion with Cap SAR. Sara occasionally attends obedience tests (A, A0, BGH, GH) with her dogs and she plans to become involved with competitive obedience to a greater degree in the future and, should time permit, (GH2, GH3). Sara graduated in biology-ecology from the Faculty of Science, University of Zagreb. At the moment she is employed at the university’s Botanical Institute as a lecturer-assistant. She recently gave birth to our second son, who was born on 9 May 2008 in the city of Rijeka, so we now have two boys, Vilim and Viktor.